Home/Education/College students: Where to next? The Department for Employment and Learning Further Education Leaver Study 2015 outlines the position of students six months after leaving college. The 2015 study looks at the situation of college leavers who qualified in 2013/14 six months after completing their studies. The study indicated that achieving a qualification enabled students to move onto further learning or employment. Before taking their further education course, the students had an employment rate of 38 per cent. Six months after taking their respective course this level of employment increased by 10 per cent to 48 per cent. The study found that 68 per cent of college leavers in employment had also been employed before beginning their course. Almost a quarter of students (23 per cent) had been in education prior to starting their 2013/2014 studies, 6 per cent had been unemployed and 3.8 per cent were classed as other. This indicates progress towards gaining employment. For those who were already in employment before completing their course, there was some progression within the workplace. 68 per cent stated they were using the skills and knowledge acquired in their job. In relation to earnings, 21 per cent of leavers who had jobs previously were earning £400 or more a week compared to 61 per cent who had entered the workplace after their course. This would indicate that those already in employment were progressing up the pay bands either through natural increment or potentially from gaining additional qualifications. In addition, 30 per cent were on a higher wage than before their qualification in contrast to 8.4 per cent who were earning a lower wage than previously. Almost two thirds felt they were now better at their job, while 39.8 per cent said they would not have improved without completing the 2013/14 course. Nearly 30 per cent of leavers said they had more responsibilities at work than before and of this group 45 per cent attributed the extra responsibility to gaining their qualification. 12 per cent had been promoted and of these 55.3 per cent felt this would not have been possible without their studies. 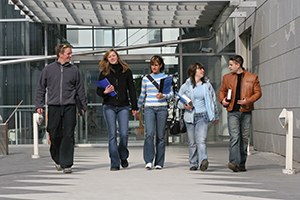 Over a third of college leavers (34 per cent) continued on to the next stage of their education. This represents a decrease from 42.5 per cent who were in education immediately prior to beginning their course. While the majority of students (82.1 per cent) had previously taken part in some form of learning, nearly a tenth started out in employment, 5 per cent from other activities and 3.8 per cent were unemployed, the latter groups indicating progression into learning. 73 per cent of leavers who continued their learning did so at a further education college, whilst almost one quarter had progressed to university. 81 per cent were studying towards a qualification at a higher level than the course completed in 2013/14. 30 per cent were studying towards a degree level qualification. 60.4 per cent of students said the course enabled them to progress onto their current learning or training. The study showed that 94 per cent of leavers said their course had a general positive impact on them. Nearly 80 per cent stated it had boosted their confidence. Three quarters of leavers reported making new friends or meeting new people. Two thirds of those surveyed also reported an increase in self-esteem and 61.9 per cent had an improved quality of life. 85 per cent were more enthusiastic about learning and more likely to undertake future learning or training. 79 per cent were more likely to do so at a higher level. 71 per cent of respondents stated that after qualifying they had a better idea of what they wanted to do in their life.